Oct. 3, 2018 - With the lumber industry in an upswing and many mills demanding more inventory, it’s understandable that contractors are running their operations longer to increase their volume. 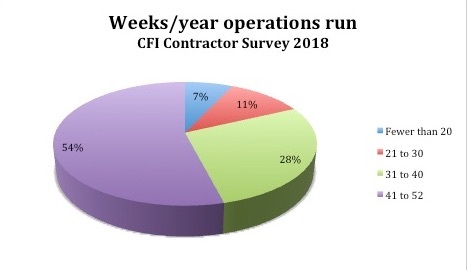 Results from our 2018 CFI Contractor Survey show more than half of loggers (54%) run their operations 41 to 52 weeks of the year. That’s a jump from the 40 per cent who reported the same operating season in our 2016 survey. Just over a quarter of contractors run for 31 to 40 weeks, while 11 per cent run 21 to 30 weeks, and just 7 per cent run fewer than 20 weeks. All regions saw more than half operating at least 41 weeks of the year, save for Alberta at 36 per cent and Quebec at 44 per cent. Quebec also has the highest portion of contractors operating fewer than 20 weeks a year, at 17 per cent. Percentage of contractors who report operating in these week ranges each year. When it comes to weekly hours, contractors report similar numbers in 2018 as they did in 2016. More than a third of respondents operate between 51 and 70 hours per week, while just 3 per cent are running more than 130 hours each week, all of which are in Alberta, likely making up for their shorter operating season. 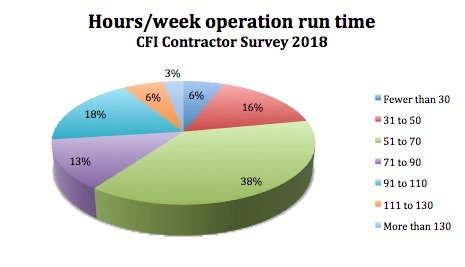 Percentage of contractors who report running these hours each week. With longer operating seasons it should follow that crews work fewer hours each week. But when asked about their personal workload, the results are nearly identical in 2018 and 2016. 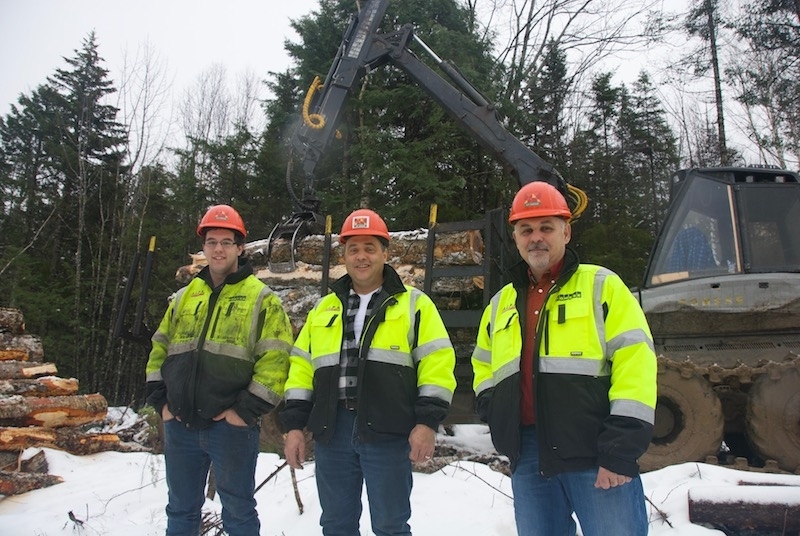 There was a slight drop in the largest category, with 59 per cent of loggers working more than 55 hours per week in 2018 compared to 61 per cent in 2016. Alberta stands out again with 93 per cent of loggers there working more than 55 hours each week. 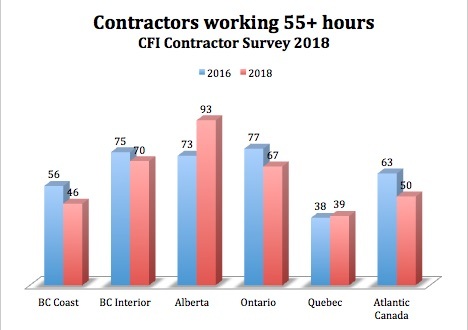 Quebec also saw a slight increase at 39 per cent, although it is still the region with the most contractors working “reasonable” hours. Percentage of contractors working more than 55 hours per week.